Madaxeman's Wargames Blog: Who's Playing What Right Now? Surely it should be in there, regardless of the number of elements! At face value it looks like your figures show an increase in participation in 2017 against 2016. Is this true? Plus can you say how much crossover there is with people playing more than one rule set in agiven year? I'm looking to get the DBA data, but event results are not as easily accessible as for other sets - mainly as there is no published ranking system taht Ive been able to find. There are relatively few people who actively "double-up" - offhand I can only think of quite literally a handful of people who are actively playing in two of these sets. 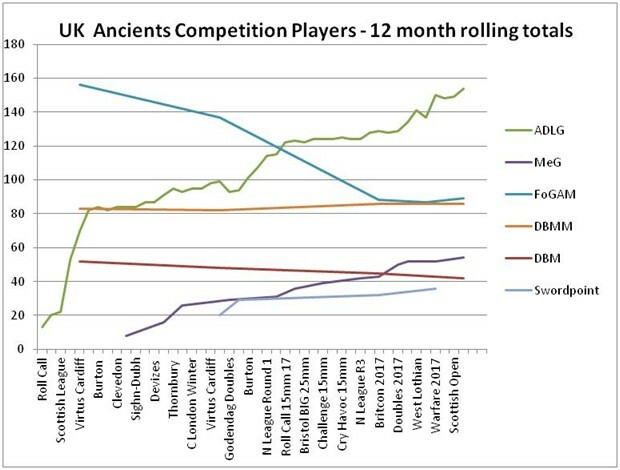 The rest - which could maybe be 20 at a guess who appear twice - are mostly people who have stopped playing one system and picked up another, but they are lingering on in their "old" ranking system until it becomes more than a year since they played their last event. The biggest crossover of this I think is FoGAM to ADLG. Now that the main Scottish event Schiltron has swapped to ADLG only I think there will be an 8-10 lurch downwards in FoG numbers after it takes place 9and drops out fo the FoG rankings completely). Anecdotally there may also be a similar lurch at Burton in a couple of weeks if the "only play one event a year" FoG community who have done Burton historically move to ADLG - which based on what I hear about advance bookings is an entirely feasible scenario. Since there's a reprint of ADLG in English due very soon I'd expect to see a bigger uptake in numbers. 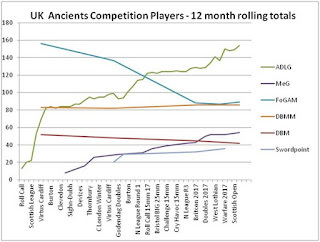 Course these figures only reflect "events" with rankings,for normal club games ADLG is getting huge. On TMP a fella was looking to buy the rules,I offered him my copy. Had 6 other folk wanting to buy contact me within 2 hours. Wow. 4th reprint I suspect will mean more than 6,000 copies in circulation, as I understand the first few print and reprints were 1,500-2,000 each set.